By understanding each type of yoga and all the subtle differences between each, you will be better able to choose the best one for you. Anusara Yoga: A modern version of the Hatha yoga system founded by John Friend in 1997, it pushes the philosophy that we are all inherently good and emphasises the “universal principles of alignment”. Anusara yoga is based on the philosophy that your life is a gift that can be celebrated through practising yoga. Ashtanga Yoga: A style of yoga comprising six series founded by K. Pattabhi Jois in the 20th Century which is often promoted as a modern form of classical Indian yoga. Ashtanga yoga literally means “eight-limbed yoga” and each of the eight limbs includes: Yama [moral codes], Niyama [self-purification and study], Asana [posture], Pranayama [breath control], Pratyahara [sense control], Dharana [concentration], Dhyana [meditation], Samadhi [absorption into the Universal]. It has also been referred to by the generic term “power yoga” which refers to any type of aerobically vigorous yoga derived from this type of yoga. Bikram Yoga: Also known as a hot yoga style, this form of yoga goes for about 90 minutes and consists of the same series of 26 postures and 2 breathing exercises based on traditional hatha yoga techniques, which became popular in the early 70s. Ideally this form of yoga is practised in a room that is heated to 40 degrees Celsius with a humidity of 40%. All teachers taking these Bikram-certified classes have instructors who have completed nine weeks of training endorsed by Choudhury. While they are taught a standard structure to running the class, they are also encouraged o develop their teaching skills the longer they teach. This results in varying deliveries and distinct teaching styles. Corporate Yoga: Also known as yoga in the workplace – it is dedicated to promoting health, wellness and engagement at your workplace. These classes are tailored to your needs and include group and private yoga, meditation and mindfulness sessions. It’s great for the health of participants and it improves productivity – what better way to reward your employees. Need to set it up a couple of sessions for your workplace? 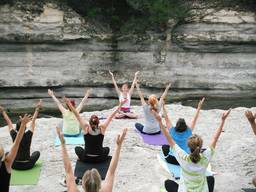 Search for a Corporate Yoga listing near you! Hatha Yoga: A very broad term that encompasses any of the physical practices of yoga, it means “forceful” in Sanskrit. Although it’s considered gentle and it can be a great introduction to yoga, Hatha Yoga can still be physically and mentally challenging. These classes provide an opportunity to stretch, unwind and release tension. Hot Yoga: This centre-flow yoga practice develops strength, clarity, peace and connection and raises self-esteem and self-confidence through a challenging physical practice that awakens the mind, reduces stress and improves the body. Working out in a room that’s 35-40 degrees Celsius with a high humidity helps to loosen the muscles and joints to improve flexibility and mobility and allows you to work deeper into muscles, ligaments and joints. Hot yoga can also be used to describe any number of styles that use heat to increase an individual’s flexibility in the poses. Iyengar Yoga: Developed by B.K.S Iyengar – it systemises 200 classical yoga poses, 14 different types of Pranayama (including variations of many of them) and makes sues of props such as belts, blocks and blankets to help perform the asanas correctly and minimise the risk of injury or strain. Ranging from beginners to advanced, Inyengar Yoga ensures students progress gradually by moving from simple poses to more complex ones as they develop their mind, body and spirit through this step-by-step approach. Jivamukti Yoga: Created by David Life and Sharon Gannon in 1984, this style of yoga is physical, ethical and spiritual as it combines an energetic hatha yoga, based on vinyasa with phsycail style and adherence to five tenets including: Shastra (scripture), bhakti (devotion), ahimsa (non-violence/non-harming), nāda (music) and dhyana (meditation). The celebrity yoga style of choice, Jivamukti Yoga also emphasises animal rights, veganism, environmentalism and social activism as it provides a path to enlightenment through compassion for all beings. Kripalu Yoga: A form of yoga that uses inner focus, meditation, standard yoga poses, breathwork, relaxation and the development of a quiet mind. The emphasis of Kripalu Yoga teachings is on “following the flow” of prana and using life-force energy, compassionate self-acceptance, observing the activity of the mind without judgement and learning from daily life. Kundalini Yoga: Also known as laya yoga or “the yoga of awareness”, this style of yoga is influenced by Shaktism and Tantra schools of Hinduism. Kundalini Yoga focuses on awakening kundalini energy through regular practise of meditation, pranayama, chanting mantra and yoga asana. It aims to nurture your creative spiritual potential to uphold values, speak the truth and focuses on compassion and consciousness needed to serve and health others. Mantra Yoga: Using a similar science as a mantra – where words are chanted with concentration and devotion to yield results in the physical, mental and spiritual space – Mantra Yoga uses an exact science where the mantras are signposts for the wandering mind, and helping to steer it back into a state that poses it for meditation. By engaging the mind using repetitive mantras, the chanting produces positive vibrations and participants are offered a means to get them closer to the divinity within, while the technique is believed to benefit people who listen as well as practise it. Power Yoga: A modern, athletic-based yoga practise performed in a heated room that includes elements inspired from Vinyasa and Ashtanga yoga. Power Yoga doesn’t follow a set sequence which means each class can be varied. However, the poses are performed in flowing sequence with a strong attention to linking the movement to the breath, similar to Vinyasa yoga. Drink plenty of water before, during and after practice, and pregnant women are advised to consult their doctor before participating. Prenatal Yoga: Designed to assist women to relax as they move through the changes and growth associated with pregnancy, birth and early motherhood, these classes provide ease, support and connection between the mother and baby in utero. Prenatal Yoga also assists to generate positive feelings, enhance energy levels, improve relaxation and overall wellbeing and reduce adverse effects. Purna Yoga: Purna means complete or total and this style of yoga nurtures all aspects of the being – physical, emotional, mentals and spiritual. Purna Yoga is holistic as it combines the alignment-focused postures, philosophy, meditation, pranayama breath control and the yogic personal and social code of ethics. Designed to help people fulfil their dharma – or their life purpose. Raja Yoga: This style of yoga emphasises the benefits of meditation for realisation of the spiritual self and offers purpose to the evolution of consciousness. Raja Yoga aims to clear the mind and bring it to one focus point to direct attention inwardly towards the divine. This is achieved by following the eight-fold path. Restorative Yoga: Based on the teachings of BKS Iyenger, if you’re looking for a type of yoga will leave you feeling completely rested and relaxed, this may be for you. Typically involving five or six poses in a sequence, Restorative Yoga is supported by props and includes light twists, seated forward folds and gentle bends backward. Satyananda Yoga: Created to suit our lifestyle but based on traditional and ancient sources of yoga, this system was developed by Swami Satyananda Saraswati and his lineage. Promoting awareness to all aspects of your being, using postures to stretch, tone and relax your body, breathing is used to balance the energy in the body, meditation is used to calm and focus the mind and deep relaxation (yoga nidra) is used to reduce stress, promote healing and create a sense of wellbeing. There are a range of postures for beginners to the advanced within Satyananda Yoga with a strong emphasis on yogic lifestyle for balance and to help you enjoy an enriched life. Sivananda Yoga: If you’re looking to fuse your mind body and spirit with a blend of knowledge and spiritual practises, Sivananda Yoga may suit you. The five principles involved in practising this type of yoga include: proper exercises (Asanas), proper breathing (Pranayama), proper relaxation (Savasana), proper diet (Vegetarian) and meditation (Dhyana). Every yogi and human being has and identifies with intellect, heart, body and mind, which is why Swami Sivanada created these techniques from each path (also known as the Yoga of Synthesis). Tibetan Yoga: Comprising five yogic exercises, known as the 5 Tibetan Rites, meditation, praanayam and positive thinking. An important part of this yoga is the conscious synchronisation of breathing as participants perform the physical activity. Tibetan Yoga helps balance the seven chakras and it may also regulate your hormone output. Vinyāsa Yoga: If you like the idea of coordinating movement with breath as you flow from one pose into the next, Vinyāsa Yoga may be ideal. The word Vinyasa can be used to describe the sequence of poses that are performed, such as Downward Facing Dog (Adho Mukha Syanasanas) as part of the Sun Salutation (Surya Namaskara) sequence. Sequence and flow are very important to this style of yoga. Yin Yoga: A slow-paced style of yoga with postures (Asanas) that are help for a certain period of time (generally between 45 seconds to two minutes and up to five minutes for advanced practitioners). Yin yoga applies moderate stress to the connective tissues of the body, including to the tendons, fascia and ligaments, with the aim of increasing circulation in the joints and improving flexibility. Yin yoga take a more meditative approach to yoga, yin aims at cultivating awareness of inner silence, and bringing to the light a quality connection. For more information and ideas, please search for Yoga on the Health4You directory to find a yoga listing near you.